Every fall, I put some of my hyacinth bulbs in a paper sack and put that sack in the refrigerator. 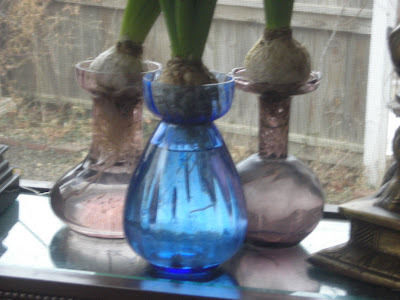 The bulbs need at least 12 weeks of "cooling" time in order to get them to burst into winter bloom. What got me started was the blue vase. A Victorian Forcing Vase. 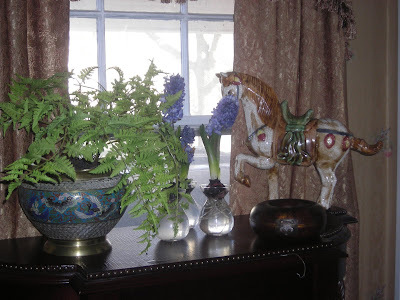 I love anything blue and I had read about forcing hyacinths so when I bought it I knew what it was. That first hyacinth was a true treasure. The fragrance inside that winter was incredible. Over the years, I've found two more, but, alas, not in blue. One is pink and the other more lilac than pink. I'm forever on the lookout for more, but they are truly rare. Hopefully, my collection will continue to grow although slowly. I love the way the sunlight shines through these colorful vases. At a Lowe's (or Home Depot) one year after Christmas they had boxed hyacinths with forcing vases. Utilitarian, plain glass ones. But they do the job! 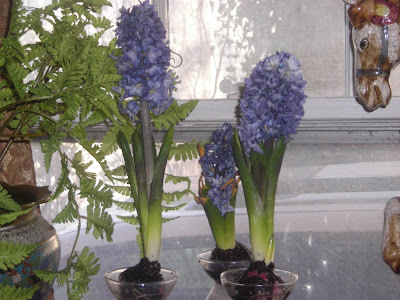 Another sunny window and three more hyacinths. I usually get the purple ones for these vases. They're at the bottom of the stairs and they do make the living room heady with their fragrance. I can't imagine late January or February without hyacinths. It's a little bit of the taste of spring to come in March and April. 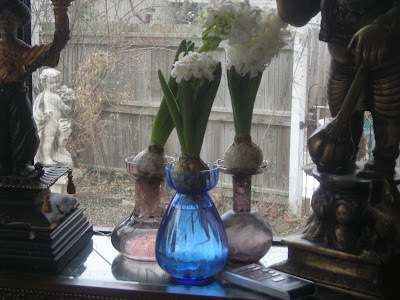 i agree nothing smells better than Hyacinths in mid winter. i prefer them outside under the peopnies, but he deer get to them before I do. One of my favourite fragrances, and I love your blue vases. Pamela -- I wish I had more! Alas, they are rare and very hard to find!